White Water Flash: Pretty fly for a water guy. The challenge for surf kayaking has always been to find that happy middle ground of maneuverability, speed and durability. "The problem with kayaks," says Dennis Judson, director of this year's Kayak Surf Festival, "is that they can't duck-dive. Kayaks are like a bubble; when they're caught in the soup, they really get popped up, and they're now part of that whitewater." "You come out of your boat," continues Judson, "and you've basically lost $2,000 to $3,000." The "problems" with kayaks have led to a myriad of innovations that have been quickly transforming the sport, which now incorporates elements of surfing and river kayaking--so much so that this weekend's festival features three distinct events: surf kayaking, rodeo kayaking and wave skiing. 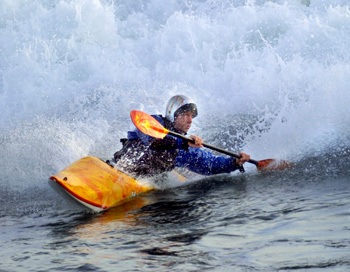 The three events can be most easily distinguished by the equipment--surf kayaks are built for speed and, unlike plastic river kayaks, don't like rocks. "Surf kayaks don't want to hit rocks," says Judson. "We would like to have it light enough to fly out of the water." River kayakers, on the other hand--who might intentionally bounce their boat off a rock to avoid a potentially lethal hole on the rebound before cartwheeling down a waterfall--look for durability and maneuverability in their rides, which are commonly made of plastic. This year's "rodeo" competition incorporates flashy whitewater tricks in special hybrid boats that are good for stunts and a bit of speed. But probably the strangest sight of all will be the expert wave ski competition. If you're wondering what in the hell a wave ski is, it's basically a surfboard with someone, paddle in hand, sitting on and strapped to it. Obviously, the organizers are hoping for big waves and lots of sun for the festival, which attracts some of the country's best surf kayakers--although we all know that more than a few of them, including Dennis Judson, Mark Pastick, Jono Stevens, Steve Hiegel and Teresa Rogerson, live right here in town. But we shudder to think what would happen to the wave skiers if the surf is anything like it was a couple weeks back. Carnage, anyone? "Why we call it a festival is because we want everyone to get involved," says Judson. "We support Save our Shores and the Surfrider Foundation through our silent auction, and we've got all the manufacturers right here, so people can walk to edge of the cliffs, see some of best athletes in the world surfing swells and turn around and talk to the manufacturers who make the kayaks. It's really a spectator-friendly gig." The 19th Annual Santa Cruz Surf Kayak Festival runs March 18-20, 7am-5pm, but there's lots of action after-hours. Hobnob with participants as they lick their wounds and commune with each other: March 17, 7pm, at the Adventure Sports Unlimited office; March 18, 5-10pm, at Club Caution; and March 19, 6-10pm, at Olita's on the Wharf. From the March 16-23, 2005 issue of Metro Santa Cruz.